I am a big fan of the command line and love to use the keyboard and shortcuts. If I can do it in a shortcut and a few key presses, it’s usually better than reaching for the mouse or track pad. I like working this way, it’s quick and tests my brain, sort of, it’s a bit like trying to remember the “finishing moves” mortal combat back in the 90s. So whats this all about…. @AlfredApp!! 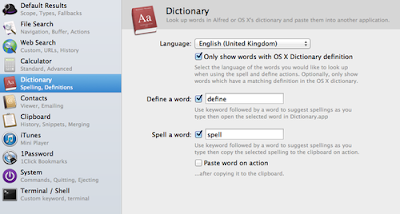 I installed Alfred a few months back as a demo, I read a bit of the blurb but didn’t really take it in. I played round with the fee trial and thought it was ok, it’s a bit like spotlight, why do I need another spotlight? Apple already created it, it works well helps me find stuff easily! I decided to leave Alfred where it was and not bother with it again until I read a blog post from @1Password (another killer app). It looked kind of handy that you could invoke Alfred (alt+space bar), type 1P and then the name of the page you wanted to log into and the browser would launch and log you in. I have a few home routers, a NAS and other devices with web interfaces round the house that would be really handy if I could do this for. I decided to revisit the Alfred demo and pay more attention to it, within half an hour I was sold! I had bought the power pack and was deep under the bonnet of Alfred. 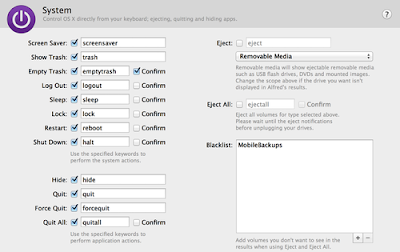 1st stop features, using alfred features is really easy and helps you get things done quickly. 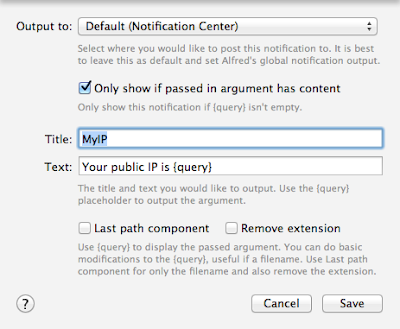 Features are the built in functions of Alfred that the core developers have built in for you. You can simply invoke alfred by hitting alt + space together (or any other hot key combo you define) which launches the alfred interface. In the search bar you can then search your contacts, search the dictionary for a word you want to spell, empty the trash, launch any application or ask 1password to to open a link and inject the credentials. All really simple stuff that help you move quickly through apps. Some of the System features are really handy, if you are moving from windows to osx you might miss things like ctrl+alt+del to lock the screen. This has been built into features so that all you need to do is alt+space then type “lock”. Alfred locks the desktop for you. After playing with the features I started to look at Workflows, these seemed interesting but needed a bit more thought. Within the workflows you have the ability to customise how you want alfred to behave, what you want it to launch and how you want it to search. 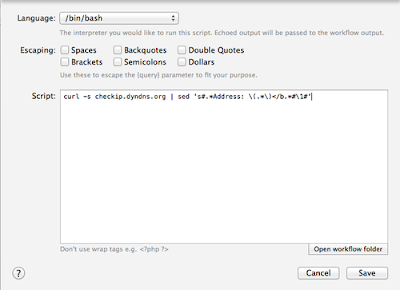 You can pass it a search term, which in turn can call a python script and return you some data. This can be displayed in huge writing on the screen or a simple notification in the notification centre. I decided to start with a simple script. All it would do is work out my public IP and display it, nothing ground breaking but pretty handy. To do this I would call a bash script that would query checkip.dyndns.org and then display the result to the screen. Within 10-15 mins I had created a handy little tool. Currency Convertor - Does what it says on the tin, you pump in the value in the currency you have and it spits out the GBP using google finance to calculate. Dig - Makes DNS queries quick and simple, also can handle different types of DNS queries by passing in the type at the end e.g. dig bbc.com MX would give you the MX records. Skype - There are a number of commands that let you instantly message your contacts or make a call.